Wisdom of Life. : Work and yet not working!!!! Today a lady friend sent me this message.. "Dear can I not work and still earn lots of money? Funny way to ask such question but nevertheless I replied her with a big "YES!" She responded, "How la... I'm lost... no energy... not focus & also lazy!!" I always could think of a quick answer, "Simple my dear. Just get a hobby you love and your hobby will take care of you." This was her expression, "Eeeeeeee Eeeeeeeee!!!" My reply to her was, "Please read my post tomorrow and you would understand." My dear.... Never take your job as work because working in the long run could be tiring, boring, unchallenged and you might give up quite easily. Look for something you really like or perhaps something you love doing. The best is to pick a hobby you love. Hobby is an interest that would keep you occupy a life time. Whereas working on a job has a time frame, when you need to retire one day. I have not been working for the past 30 years, ever since I took up the hobby of preaching life insurance. I love talking and insurance allows me to meet people. I don't just talk for the sake of talking, but rather to listen and to understand people that I meet and know. Part of this hobby is to be genuinely and sincerely try to make other people happy or to help people get what they want. Give you one good example how I enjoyed my hobby today. On the phone with Azeesur this morning, he sounded not very happy. My senses could tell that his tune of voice was sad. Immediately I drove to his shop which took me one hour to reach there. He was surprised I came. The next one hour he was pouring his sorrow and frustration over his business. Though business is good but his few workers are unreliable. He is tired and frustrated with his work too. Azeesur is only 55, who is 10 years my junior and already out of steam. Treating him as a younger brother, I motivated him with stories which I had gathered and I inspired him with proverbs and quatotations which he hadn't heard before. He was excited with my stories and emotionally he felt great with my wisdom. Yes! He was working too long in his business alone, when nobody knows how to give him the extra energy. The skills and interest I developed on my hobby could really spur and pep him up again. Before I left, I could see his face was happier with full of confidence. Ah! My dear forgotten to tell you. Very willingly he signed up another medical policy for his wife. See! My hobby could also take care of my financial needs as well. Was I working? No my dear! I was really having a lot of fun cause he was giving me so much of attention and respect. So! Have I answered your question? Food of thought - “Choose a job you love, and you will never have to work a day in your life.” - Confucius. 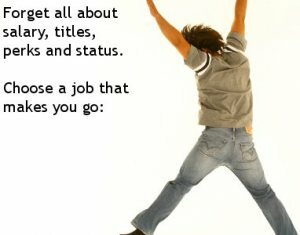 haiz, don't know want to become insurance agent or not..
what if i the job i love was doing nothing? OMG ! Hi Robert. Your story looks too Ideal to be believed. If you treat your customers as king and they are always right, you are like a slave to your customers! ANd I have never heard anybody truly happy in that role, although paid well!!?? Sorry, your story looks fairy taled! Gardening is considered as a hobby. To the person who loves gardening, the work spend on it is never work. Whereas the worker who works in gardening, treats it as a work. You have to soul search for the hobby yourself young man. The best way to convince you, is, if you allow me to talk to you personally. Azeesur was at lost until I spoke to him face to face. To be effective in talking, we need the five senses. They are sight, ear, smell, taste and touches. Writing is the least effective to convince another person. To those who don't believe in working as a hobby, then it won't work. Take this quote from George Washington who said... "Do the common things, in an uncommon way. The world will be at your command." The choice is yours my dear. Best of luck. Hi Robert, thanks for your thoughts. Is writing also your hobby? 'The pen is mightier than the sword!' is a well known saying. Perhaps one day I will like to hear you directly to personally experience your area of expertise you so much talk about! And that is really a priviledge for a young lady like me! One can talk well might not write well. Is only five years ago, I started to learn to write. I'm not a professional writer but I'm glad an intelligent lady like you would read my post and added your beautiful name onto this comment. Yes! I had written this title... "The pen is mightier than the sword!" few years ago too. Let me have a chance to speak with you, and you would be amazed I speak much better than my pen. Thank you for reading this blog my dear. Hi Robert. Thanks for the nice offer. One day, perhaps one fine day! Keep up the good samaritan work! Work that originates from the purest of hearts! Yes gardening can be a hobby. Turning gardening into a business is a totally new proposition! It's now a business, you need to be very conscious of costs, quality, customer service, staff welfare and a host of other things?? Easier said than done! Right Mr Robert?? Sorry for the late reply. Was away. I'm not proposing to start gardening as a business but rather was... If you happened to have gardening as a hobby, you would enjoy doing it for life. And I believe those who are in gardening business, and also love gardening, they would do well in their doing.